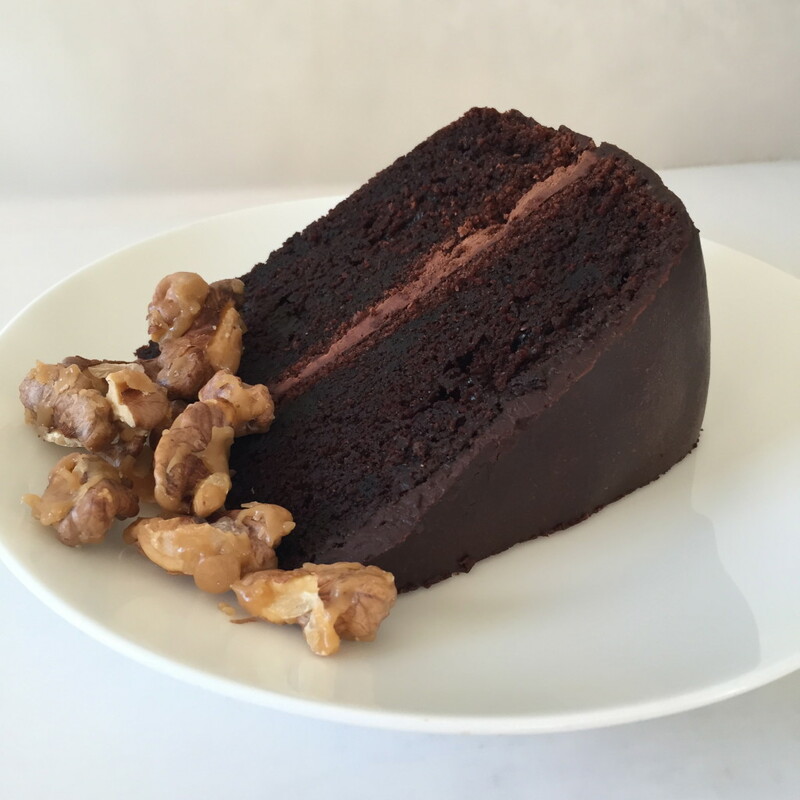 No Butter Chocolate Cake with whipped chocolate ganache filling and chocolate ganache icing with a side of honey toffee walnuts. This is an excellent, versatile, and quick chocolate cake recipe that uses oil instead of butter. This is now my standard ‘go-to-chocolate-cake-recipe’. It is also a very forgiving recipe, in the sense that you can use a cake mixer if you like, but you can also ditch the mixer and just use a fork to whisk the ingredients together. For an even quicker version I reduce the recipe to half, and cook the cake in a bundt tin (the tin with the hole in the centre, like a doughnut) and it works perfectly (the measurements for making half the mixture are in the brackets below). I have also added the recipe for the chocolate ganache that serves a double purpose; firstly as the icing, and secondly, when whipped, as the ganache cake filling, (as seen in the above photo). Set oven to 180 degrees Celsius. Grease two 8-inch cake tins, and line the bases with baking paper. In a large bowl (or bowl of a cake mixer) add flour, sugar, cocoa, baking powder, baking soda, and salt. Stir together. Whisk eggs with milk and vanilla. To the dry ingredients add the whisked eggs, milk, and vanilla, and the vegetable oil. Mix together by hand or with a cake mixer. Then add 1 cup of boiling water to the mixture and stir in well. Pour cake mixture evenly into tins. Bake for 30-35 minutes until the middle is cooked (test with a skewer until it comes out clean). Cool cake for 10 minutes in the cake tin, and then remove. When cake is completely cool, add your choice of filling and icing. Chop the chocolate roughly but finely so the pieces are small enough to melt quickly and evenly. Place the double cream in a pot and heat until the cream is almost, but not quite, boiling. Remove from the heat. Tip the chopped chocolate into the cream, leave it to melt for a few seconds, then whisk until cream and chocolate are combined and smooth. Halve the ganache into two bowls. Place one bowl in the fridge to cool (for the cake filling), and leave the other at room temperature (for the icing). Filling: When the ganache from the fridge has cooled, but is still slightly warm, use an electric beater and whip the ganache until it turns a light colour. Work quickly to spread the whipped ganache on one cake for the filling, and then place the second cake on top. Icing: Pour the ganache left at room temperature, over the top of the cake and spread over. Either let the gananch drizzle down the side of the cake or leave some ganache aside and use this to apply to the side of the cake when it is slightly firmer.